Since it was so well received last year, we decided to do it again. 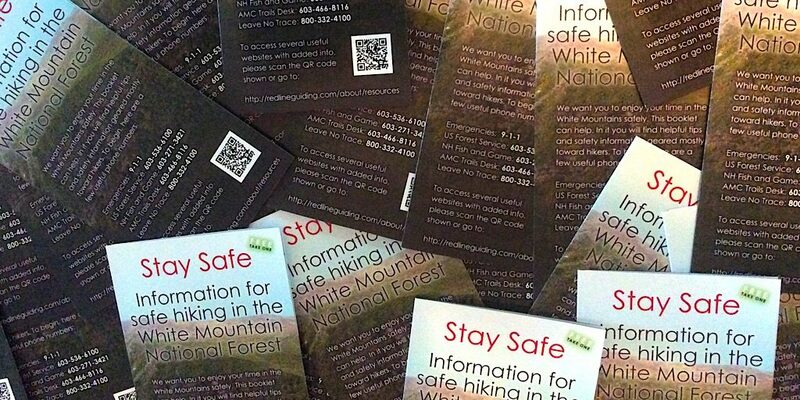 Look for these mini trifold hiker safety pamphlets throughout the Mt Washington Valley and beyond, particularly at lodgings. Outside design of pamphlet – click to view larger size. Inside design of pamphlet – click to view larger size. PRINT IT YOURSELF: Download as a PDF file for the option to print-it-yourself. Project Sponsors and Supporters… Thank you! Local Distribution in the Mt Washington Valley and Beyond… Thank you! Look for these pamphlets (while supplies last) at the following 162 establishments, listed in no particular order. These folks care about your well being so we hope you’ll visit them while you’re here in our area (links open in a new window/tab). With the help of all of these people, and all of these establishments… well, if but one life can be saved, it is so worth the effort. 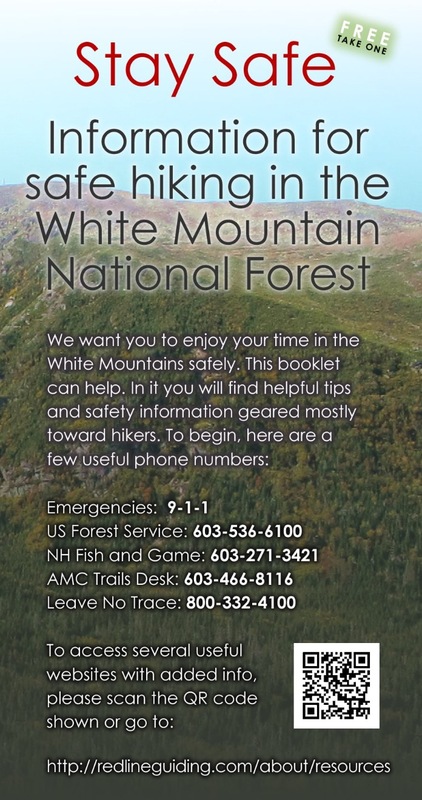 Enjoy the White Mountain National Forest. We hope to keep you coming back year, after year, after year. Attention sponsors and distributors: Please feel free to use the following press release if you would like to help us spread the word and let folks know about your role in this campaign. You may also use the related images on this page. 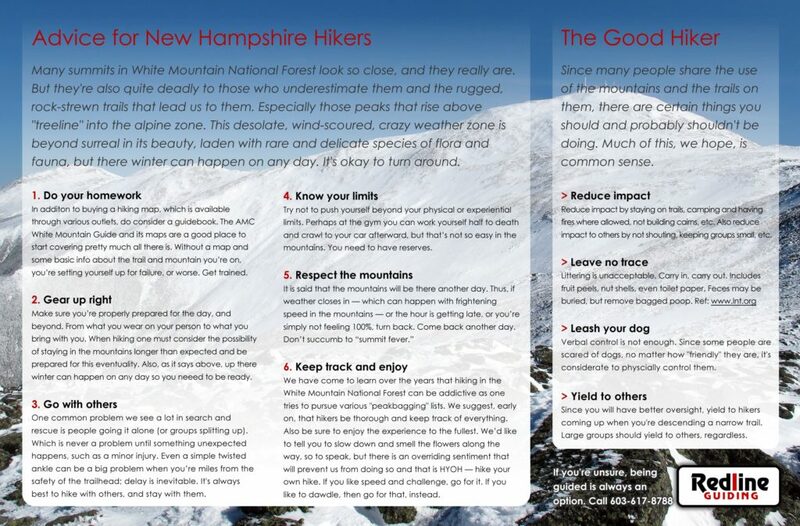 PRESS RELEASE: [CITY, STATE]: Addressing the hiker ignorance situation head on, [YOUR ORGANIZATION/COMPANY NAME], is doing their part by [SPONSORING or DISTRIBUTING] the ubiquitous "Stay Safe" White Mountain Hiker Safety Information Pamphlets created by the North Conway hiking guide and outdoor education company, Redline Guiding. These clever and informative pamphlets may be found at select locations throughout the area and contain a wealth of practical tips designed to help hikers be well and do well in our area's treasured but sometimes dangerous and unforgiving mountains. There are over 160 establishments distributing these pamphlets and five sponsors of the project. [YOUR ORGANIZATION/COMPANY NAME] is proud and excited to be part of this noble effort. Front cover of pamphlet. Click for larger size. Back cover of pamphlet. Click for larger size. 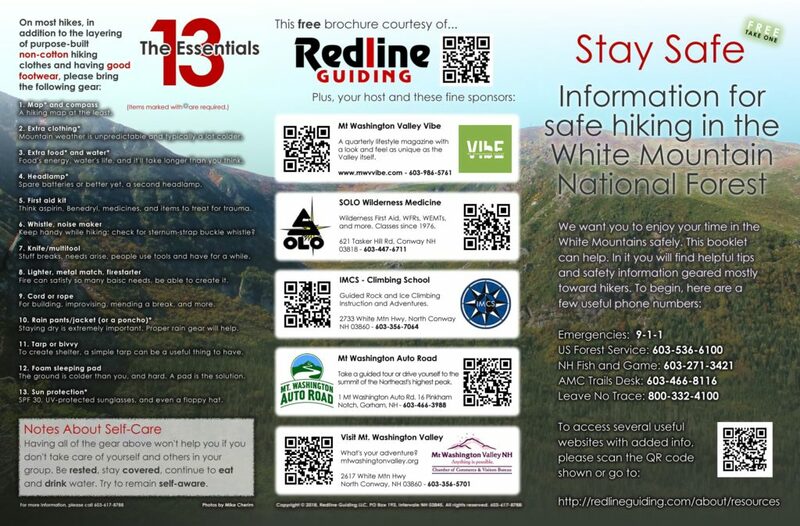 Thank you for helping us help hikers! 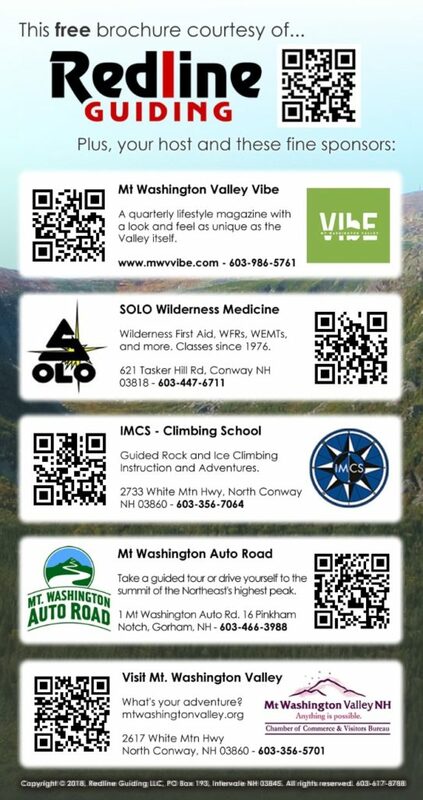 If you have a visitor-centric organization in or near the White Mountain National Forest and would like to help, or if you need another stack, contact us (you can also print your own). Together we can help people Stay Safe!